Democrats are getting ready to do battle for universal health insurance, having learned valuable lessons from the failure of Bill Clinton's sweeping effort. Before they spend the $634 Billion on supplementing and being a test run for future efforts at taking over one eighth of the economy, I wish they could get Medicare right first. Bleeding money, losing doctors, and growing in regulatory oppression, yeah, government run health care works so well. Obama just wants the opportunity to make everyone's life just as miserable as those already on government health care. Shouldn't be hard to accomplish. Don't You Want One of These? Pork barrel spending, otherwise known as earmarks, are individual spending items added by a Senator or Representative without going through the normal appropriations procedure. Often inserted by committee chairmen prior to final passage, most people don't know that they even exist. But they are a valued part of governance it seems, even as Obama has called the massive spending bill known as the "stimulus" being free from pork, it still displays all of the basic elements of being pork, while at the same time amounting to over a trillion (Sorry, first time, it was billion, but that is just such a little number these days). Now we learn that the leaders of both houses are against the idea of removing pork as we spend our way into oblivion. Senate Majority Leader Harry Reid wants the White House to tread lightly on earmarks, saying that any push by the Obama administration to clamp down on pet projects would be met with strong opposition from congressional leaders. In this way, we the People will be able to do that which our elected officials seem hopelessly incompetent to do. Criminal Justice for Fun and Profit. The esteemed Sen. Shockley has proposed SB 263 which deals with the imposition of Public Defender fees. (E) FELONY TRIAL, $1,000 PER DAY OF TRIAL." Nothing like law enforcement for profit. I wonder if they will go public and sell shares. Would certainly do better than any stocks I have right now. The Anchoress misses Bush. If you don't suffer from Bush Derangement Syndrome, it is a pretty good analysis of the false claims of outrage on so many levels that the Left employed to destroy someone who didn't deserve it. As she said elsewhere: Class shows. No,I am not talking about Bernie Madoff. His $50 Billion Ponzi scheme is small potatoes compared to what this scam is (although Madoff has certainly established himself as a future commissioner of Social Security). This sting dwarfs all of the other forms of theft cumulatively. But you have to admire the audacity of this theft. Any good con man knows that they have to keep the designated target of their theft on their toes, driven by two things: Fear and greed. And that is how the Obama stimulus plan was sold to us. Remember how Obama was saying that immediate action had to be taken, that any delay would prove disastrous? So much speed that out elected leaders had no chance to read the final bill and had to vote on it based on trust. Fools. * $220 million for the International Boundary and Water Commission, U.S. and Mexico. Now, can anyone spot an item in this list that couldn't have waited for the normal budgetary process? I didn't think so. No, the reasons that these items are in this emergency spending is because they never would have been passed through the regular appropriations process. Add to this spending the mortgage foreclosure boondoggle, and we are talking about an amount of money that is darned near unimaginable. And to think that our own Max Baucus is the chairman of the Senate Finance Committee. I would be curious to know if Max approved these items, and if he did, why? Well Max? What about it? Did you approve these items or not? Jay Stevens at Left in the West is like many on the Left, taking Rick Santelli to task for railing against Obama's plan for people facing foreclosures. Titled "A Tea Party for Redcoats" the basic gist of both Jay's article and the self satisfied comments below, seem to be how dare anyone complain about a fiscally insane policy if its meant to help poor people. While Dave Budge does a good job in the comments section of correcting at least some of the most obvious errors (and these people that are being corrected want to run economic policy?) there is no sense that they are open to any opinion other than their own. Comrades! The revolt by the five kulak volost's must be suppressed without mercy. The interest of the entire revolution demands this, because we have now before us our final decisive battle "with the kulaks." We need to set an example. 1) You need to hang (hang without fail, so that the public sees) at least 100 notorious kulaks, the rich, and the bloodsuckers. 4) Execute the hostages - in accordance with yesterday's telegram. This needs to be accomplished in such a way, that people for hundreds of miles around will see, tremble, know and scream out: let's choke and strangle those blood-sucking kulaks. But the peasants, particularly the kulaks, refused to submit willingly, despite the promise that the contribution of their property would increase the collective good. "How did peasants initially respond to the idea of collectivization? Party agitators sent to the villages to persuade peasants of the benefits of collectivization often met with skepticism and mockery. Peasants who resisted the pressure of regional party officials to enroll in collective farms were labeled as kulaks; those who feared confiscation sold off their property as quickly as they could, in effect self-dekulakizing." Obama's policies are being met with skepticism and mockery already. It's only a matter of time before the producers start to figure out that it is counterproductive to make more for the government to take. As a natural result, they will not make more. If you read the whole thing you will find that it is human nature to avoid having your efforts confiscated, much as the proposed tax hikes of Obama will incur. Sometimes, it seems that people who are supposed to be so darned smart, sure do act stupid. While styling himself as Franklin Roosevelt, Obama keeps saying that we need to not return to the failed economic policies of the past. It lifts my heart to hear that, until I realize that he wants to return to the failed economic polices of Keynes. As Obama noted in his address to the Democratic meeting a couple of weeks ago, he is being accused of having a spending bill instead of a stimulus bill. Then he asks rhetorically, "what do you think stimulus is? It's spending!" But does government spending actually create jobs? As the article linked to in the title says, government spending simply robs from Peter to pay Paul. Governments do not create wealth. Instead, through their tax policies, they destroy it. Right now, it takes thirty nine Montanans working full time paying taxes to pay for each government employee (of which I am one). 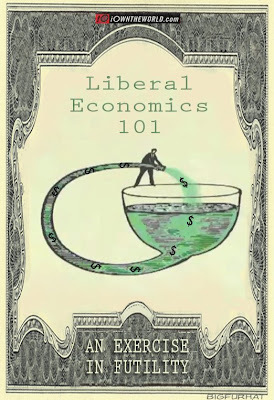 If the Left's version of economics were to be carried to its absurdist position, then if everyone worked for the government except for one person, that one person would be richer than Bill Gates. But commonsense knows that is not a true statement. Money is a measure of wealth. In a way, it is an imperfect measure, since with inflation it can be a falling measure, not a static one. It's as if your ruler keeps shrinking an inch at a time, even though it is still divided into twelve equal segments. By flooding the economy with borrowed, or worse, made up money, the value of your efforts is going to be compromised in direct proportion. Some of us are old enough to remember the old days when Jimmy Carter was president. With inflation running at 13%, retirees on fixed income were trying to find Alpo on sale, just so that they could afford something to eat. Are those days coming back? Yes, and even worse. Obama has indicated that he plans to allow the Bush tax cuts expire at the end of 2010. Raising taxes during a recession is the same policy that Herbert Hoover tried, and it also failed miserably. But raising taxes at the same time as the interest payments come due on the borrowed money for the "stimulus" is only going to further suppress any private sector economic development. By stealing capital that would otherwise be available to the private sector for investment, growth or increasing productivity, the private sector will be kept stagnant. But at least we will have unemployment insurance for all the people who are not hired by the private sector. Or, we will until the Chinese stop buying our debt. Just to shorten up the comments, let's predict the predictable responses: For instance, George Bush ran up the deficit and the debt through the war in Iraq. No doubt. But if deficit spending is supposed to get us out of the problem, Bush should have succeeded immensely under this theory, since he expanded government at a rate that Obama is going to be the only Democrat to exceed. Not to mention, that the "stimulus" bill is more expensive than the cost of the Iraq war plus all of the New Deal spending. Put together. At one time. I just don't think that you can argue that Bush was wrong for raising spending, and then say that it can be solved by more spending. Another argument is that the last time that the deficit was eliminated was under Clinton and he raised taxes. And superficially at least, that is true. Except that there were several unique factors that make that scenario impossible to replicate. First, taxes were raised after we were coming out of a recession. In spite of the trite statements about the worst economy in 50 years, the recession had ended before the election. Second, the demise of the Soviet Union led to a reduction in defense spending. In fact, the entire surplus was equal to the amount of spending reductions in defense. Not that it wasn't needed, but to claim credit for an historical anomaly is either be cynical or stupid, and I am willing to bet that Bill Clinton is not stupid. Finally, with the Republican revolution of 1994, one of the primary agenda items was welfare reform. Faced with poll numbers that showed the popularity of the reform, Clinton reluctantly signed off on the deal and then proceeded to claim credit for what he had long opposed. Fine, that's politics. But it wasn't Clinton's policies, as much as the forgoing and the tech bubble that provided for the prosperity. That is not going to happen over the next four years. By raising taxes, accelerating pet Democratic policies that have no direct improvement on the economy, Obama is going to send us into a crater that will make Herbert Hoover's mistakes look like a mere misstep versus the catastrophe that is coming. My advice: Start buying guns and ammo. You will need them. Why Can't We be More Like Sweden? When they say no subsidies to Saab? I am sure that Barak Obama is wondering what he did wrong, that Jimmy Carter has announced his support for Obama's economic plan. This is kind of like George Armstrong Custer complimenting a subsequent commander's planning. But this picture creeps me out. 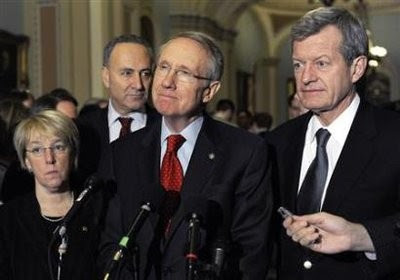 Can't tell if it's Schumer, Reid, or Murray juxtaposed with Baucus. Or, maybe it's just Max. My wife (The Good Democrat) told me that Obama's coronation was "almost a spiritual event" for her. This bothered me, because I was never sucked into the mass psychosis of the rest of the country that voted for him. But then I saw this, and it all made sense. I want to apologize to my children, my grandchildren, and to my great grandchildren who haven't even been born. We have just saddled you with over $300,000 each in debt, and we did it in just one day. Oh, and don't forget the interest. And for what? To get a tax break that amounts to $13 a week? Funding for all sorts of strange stuff that we don't even know what it is, because no one has had the chance to read what was just passed? It's called a "stimulus bill" but that's just marketing to fool the people. There is very little stimulus, but a whole bunch of problems that are being pushed through under "emergency" conditions because they never would have made it on their own. And to top it all off, because of the deficit and its impact on the debt, we will not be able to have universal health care. Add in the coming tsunami from Medicare and Medicaid, and in a few more years after that, Social Security going broke, and I am really sorry. My parents generation may have had their problems, but my generation has traded temporary gain for your long term debt. Someone in D.C. has Principles? Judd Gregg has withdrawn from being nominated for Commerce. His statement can be found here. It was classy and well written. Well done Senator. To say you are an economic conservative is to say you are a libertarian on 95% of the relevant issues. But to say you are a social liberal isn't anything like saying you are a libertarian on 95% of social issues. Social liberals are often quite aggressive advocates of using state power to impose their preffered versions of "liberty." Most libertarians are disgusted by thought-policing political correctness, by forced "sensitivity" training, by so-called Hate Crimes tribunals and racial and gender quotas. They detest smoking bans, forced volunteerism and the whole panapoly of Nanny State outrages. They may detest religious incursions on government, but they also detest governmental incursions on religion. Most libertarians are localists who believe that the federal government doesn't have an all purpose writ to make everything better. They believe in the autonomy of business and other institutions to do what they want — within obvious limits — even if what they do is bad. For example, most libertarians I know may be in favor of gay marriage, but they're against the state forcing eHarmony to provide services to homosexual customers against their will. "We are ruled by people who have achieved the remarkable distinction of being both dull and frivolous." Theodore Dalrymple. The problem is the idea that we need "rulers" at all. 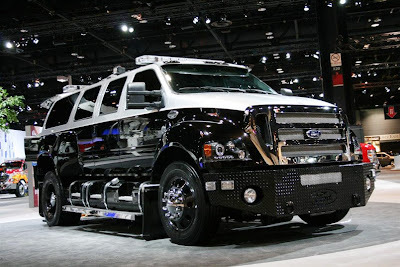 I think that my analogy might be better: We have elected a government of six year olds, given them a truck full of dynamite, and told them to build something. The fault, dear Brutus, lies not in the stars . . . . Remember Jack Abramoff? He was used by the Democrats to bring Conrad Burns down, to replace him with Jon Tester. Well, we still seem to have the same problem that was complained about (although Conrad was exonerated), where a lobbyist gives $500,000 to a politician, in exchange for that Congressman directing millions in appropriations to the same lobbyist. Oh, wait. 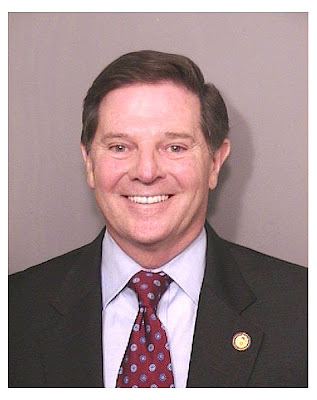 The Congressman in question is a Democrat, so I guess it's okay. I resent that it is common to term former President Bush as a "conservative." Outside of his vigorous defense of the nation from further Al-Qaeda attacks, there is very little that he did that would be considered as conservative. Just off the top of my head - No Child Left Behind, Medicare Part D the Department of Homeland Security, and more are not the programs that someone who espoused limited government would believe in. Now President Obama represents continuity rather than change. The new spending bill (as the president called it in his Williamsburg speech last week) is more of the Bush-Obama continuity and represents more of the same instead of "change you can believe in." With ironic appreciation for former Sen. John Edwards, another Tale of Two Americas. Today, under Barak H. Obama, there are two Americas, not one: One America that does the work, another that reaps the reward in the form of transfer of wealth. One America that pays the taxes, another America that writes the tax codes, and then ignores them until appointed to higher office. One America - middle-class America - whose needs Washington has long forgotten, another America - narrow-interest America such as Hollywood, unions, ACORN, - whose every wish is Washington's command. One America that is struggling to get by, another America that can buy anything it wants with borrowed money, even a Congress and a president. One America, where Arlen Specter could receive treatment for his cancer, and another, where a bureaucrat could determine that it was not cost effective for him to receive treatment. One America where if you work hard, get a house mortgage you can afford and live within your means, and another, where if you do none of the above, you will be subsidized by those who do. I Don't Care Which Side of the Abortion Argument You Are On - This is Horrible! USA Speach By Our Most Ultimate Global Power (The President) For Our Nation On The Day That Symbolizes Love "Valentines Day"
Apparently caring, has more to do with anything than knowing about spelling, or how to give directions. Just two weeks into Obama's Presidency, and the explosion of ethical violations just won't stop coming. Okay, this one is just another by Charlie Rangel, the head of the powerful Ways and Means Committee in the house. You remember Charlie, don't you? He is the guy who writes the tax code, and he forgot to report the income from his Dominican Republican properties. Oh, and his use of four rent controlled properties in New York City. Oh, and the fact that he never paid taxes on his use of the Capital garage for four years to store his Mercedes. Oh, and I forgot, the claim of a homestead exemption in Washington D.C. when his residence is in New York. 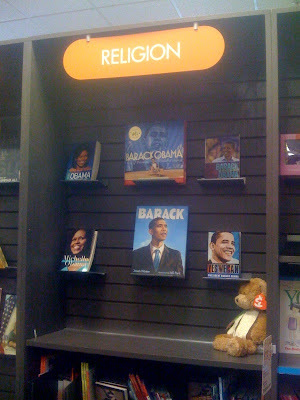 Now we learn that he has failed to report his royalties from his book. I sure bet that he is glad that he isn't a Republican. He would have been run out of town years ago. From Nancy Pelosi's 500 Million Americans are losing their job every month (just a hint, but there are only just over 306 million Americans) to Mark T's famous assertions about the tens of millions that we have killed in Iraq, to the almost a trillion dollar bailout/generational-enslavement act, liberals seem to love numbers. Which is probably why they do so poorly in math. Mark T has often accused me of parroting party lines. I am not sure why he does that, except it seems to be an alternate to his tactic of ignoring what a post says, so that he can rail about whatever he darned well feels like, even though it has nothing to do with the original post. But his favorite point is that the Lancet published a study showing how many Iraqis have died since the liberation in 2003. Just one thing - the study that the Lancet article refers to, seems to have some very serious ethical questions about its conduct. What's that you say, science used for political purposes? Say it isn't so. Sorry, from manipulated data that is kept hidden from other peer review, to manipulation of reporting station data in the great global warming debate, the truth is never as good as they want to portray it for their own ends. In addition to those tax cheats listed in O-Oh, we can now add one more. Nancy Killefer, who was chosen to be Obama's Chief Compliance Officer, also owes taxes, and is apparently going to be stepping down. Is there anyone in this administration who has been paying their taxes? Kind of makes you feel dumb, doesn't it, that you were afraid of the IRS, and dutifully, if not gladly, paid what you owed. Of course, if you were a bigwig in the Democratic Party, I guess you didn't have to. UPDATE: Oh, and I keep forgetting Franken's $70,000 faux pas. In addition to Charlie Rangel, Geithner, Daschle, Dodd's loans, Franks' intervention on behalf of a bank that was supposed to be shut down in exchange for campaign contributions, we now have Ms. Solis. Ms. Solis is the nominee for the Secretary of Labor position, but at her hearing, she has refused to answer seemingly innocuous questions related to her membership in the Americans Rights at Work, (a clever wording that would normally be prohibited under trademark laws if American Right to Work was to sue). If she was lobbying, that is certainly illegal while a member of Congress. To say the least, she has failed to disclose the association. It's too bad that so many of the President's associates are involved in less than honest activities. At least, they're not Tom Delay. Remember when then Senator Joe Biden said that "paying taxes is patriotic? I first raised the issue when Chairman of the Ways and Means committee, which writes the tax code was caught up in his own mess for not paying taxes. Since then, the current Treasury Secretary has been found to have not paid taxes as well. Sure, he was confirmed because so many people said he was so smart that only he could save the economy. What, they couldn't find a smart person who does pay taxes? Now, we have former Senate Majority Leader and former senator of South Dakota, doesn't bother to pay taxes on income that he knew he should have. It seems obvious that Senator Daschle is not a real American. I just wonder how many other well to do Democrats are breathing a sigh of relief that they haven't been asked to assist the Obama administration. It could be expensive.